Caption: Young male polar bear rests and hunts nesting seabirds on rocky cliff of Coburg Island, NW Passage, Nunavut, arctic Canada. 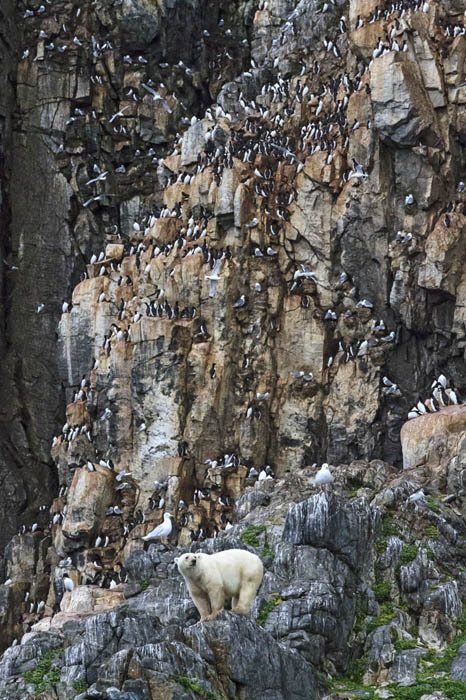 Comments: Young male polar bear rests and hunts nesting seabirds on rocky cliff of Coburg Island, NW Passage, Nunavut, arctic Canada. Most of the birds seen here are thick billed murres. Global warming may be changing bear behavior as it has been rare to see these bears in bird colonies before now.This behavior is believed to be an adaptation to climate change because of the disappearance of pack ice where bears usually hunt for seals.